Mini Wheels pasta are a miniature version of the beloved wagon wheel pasta shape called rotelle in Italian. They're always a 'kid favorite' and will surely bring you back to fun summer days when al dente pasta was the highlight of the afternoon. 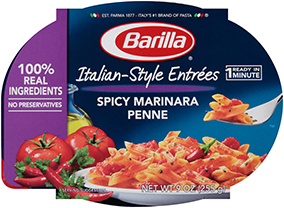 Barilla® Mini Wheels is made with non-GMO ingredients. For more information, please read our position. The fun shape of Mini Wheels pasta pairs well with simple sauces the whole family will love. Pasta wheels are also a perfect choice for pasta salad, and can be paired with light tomato sauces (with or without finely diced vegetables), dairy-based sauces, or oil-based sauces. For a light summer treat, try rotelle pasta with chicken, bacon and veggies.